A lightning bolt struck an airplane before traveling through an airport worker's body and electrocuting him. 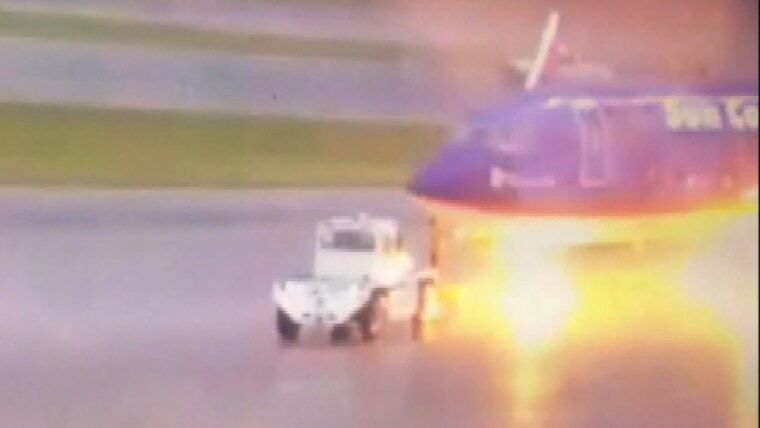 Austin Dunn, a 21-year-old airport ground worker, was standing next to a Sun Country plane on July 22 when lightning began to strike the tarmac at Southwest Florida International Airport, video obtained by NBC2 shows. In the video, the bolt hits the plane and then immediately electrocutes Dunn, causing him to fall to the ground. NBC2 reports Dunn has third-degree burns all over his body and spent two weeks in the hospital recovering. Three workers were on the tarmac during the lightning storm. One man was directing the front of the aircraft and the second was operating a vehicle to move the plane onto the runway. Dunn had been working near the plane’s wing for about a minute. After the incident, his co-workers quickly tried to find someone to help. When his family heard about the accident, they prayed for a miracle. Autumn Dunn told NBC2 her brother had a traumatizing experience. She said she was driving when her father informed her Austin had been electrocuted. “He's my best friend,” she said as she started to cry. Southwest Florida International Airport officials said lightning warning system systems were activated when Dunn was struck.